As the end of 2018 approaches, think back over the year, remember all of the things that you have accomplished and the goals that you have achieved. Think about the way you spoke to others and the way it affected them. Think of the loved ones that you spent time with and all the memories that you have to cherish in your thoughts and heart for the rest of your life. Remember your loved ones that you lost and the ones you still have that are in your life. For some, 2018 was an outstanding year while others struggled through difficult times. As the 2019 year approaches, set your goals, reach out to your family and friends, let them know that they are in your thoughts. Repair those broken relationships with family and friends so that the New Year can bring you happiness and success. Have a great holiday season and a safe New Year full of life and happiness. WE HAD A GREAT TIME THIS YEAR AT THE LONGWOOD CHRISTMAS PARADE. OUR HOST, ANDREW AND PONY PROVIDED A SNACK FOR US BEFORE WE HEADED TO THE PARADE AND THEN HAD A COOKOUT WHEN WE RETURNED TO THEIR HOME. THANK YOU BOTH FOR EVERYHTING YOU DID FOR OUR TEAMS AND MEMBERS. 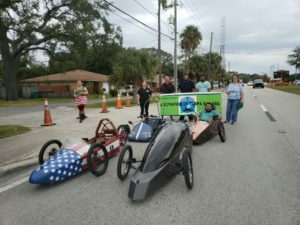 THE ELECTROCUTIONERS HAD THEIR TWO CARS AT THE PARADE ALONG WITH THE USF TEAM WITH BOTH CARS. USF’S NEW CAR HAD THE SPECTATORS SAYING “LOOK AT THAT ONE”. On December 8, 2018, we will hold our last race in 2018 before looking forward to a bigger and better 2019 with more teams and sponsors. The Simmons Team will be our host for this race giving them the home team advantage. The First Baptist Church of Plant City is located at 3309 James L. Redman Pkwy, Plant City, FL 33566. Our first race will start at 10:00am/end at 11:00 am. Our second race will start at 1:00 pm/end at 2:00 pm. Awards ceremony will follow after all of the course has been cleared. 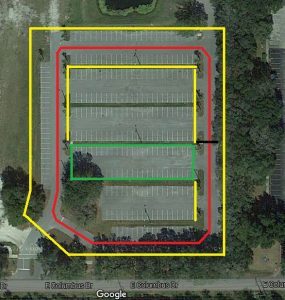 There will be a porta-potty delivered for our use while we are on site as indicated on the map. There will not be electric available for teams to charge their batteries, generators will be required, only team transport vehicle permitted in the pits, all others will park in the overflow pit parking. The track is 1757′ long, please review the information indicated on the map as there will be one entrance into our race area for teams and spectators. We are in a parade again this year, on December 1, 2018 Electrathon of Tampa Bay will attend the Longwood Florida Christmas Parade. If you plan to attend, please contact Fredi to obtain all of the information. ETO will transport at least 4 cars from the Tampa area to the race as long as teams have contacted and arranged it with Fredi, cars will be returned to the school on Monday or Tuesday after the parade. 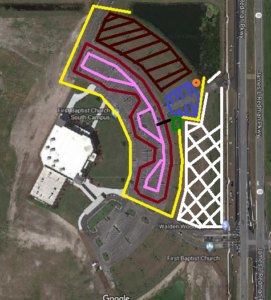 Electrathon of Tampa Bay will not have a race on November 10, 2018 due to a venue issue. We will hold an all teams workday so teams can work together on the cars and then test them. 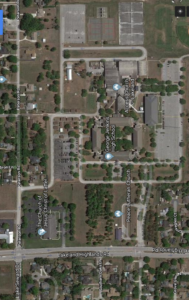 November 10, 2018 workday will be held at Simmons Career Ctr, 1202 West Grant, Plant City Florida from 8 am to 2 pm. Hamburgers and Hotdogs will be provided by ETO around 11 am. Drinks and other food that you/your team wants, must be brought by you/them. Please RSVP with Fredi or Charlie so we have enough burgers and Hotdogs. WE HAD A GOOD TURN OUT TO INCLUDE RODNEY FROM HIALEAH FLORIDA. TEAMS WORKED TOGETHER ON EACH OTHERS CARS, DROVE EACH OTHERS CARS AND ENJOYED THE HAMBURGERS AND HOTDOGS. THANK YOU SIMMONS SPONSOR WILLIAM KNIGHT, HIS PRINCIPAL MR CHAZARES FOR ALLOWING US TO USE THIER FACILITY. THANK YOU TO DEBBIE HARRISON FOR COOKING ALL THE HAMBURGERS AND HOTDOGS FOR US TO EAT. 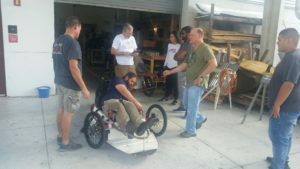 Electrathon of Tampa Bay will hold our second race of the 2018 – 2019 season on October 27, 2018 at George Jenkins High School, located at 6000 Lakeland Highlands Road, Lakeland, Florida 33813. This will be our first race in Polk County. 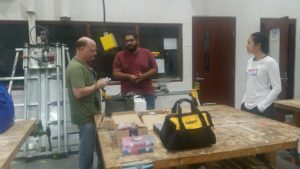 A special thank you goes to our two Team Sponsors in Polk County, Todd Thuma from Mulberry HS and James Heuslein from G. Jenkins HS for coming on board with ETO and getting a race in their area. Mulberry HS is in their second season and G. Jenkins will be on the track at this race for the very first time. Will that give them a home advantage? 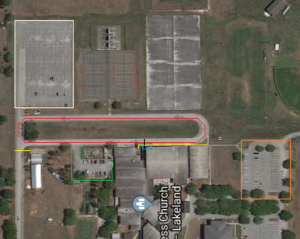 The race will be held on the bus loop located at the back of the school. The course is approximately 1700′. The pit area is good size but those with medium/large trailers should arrive early to have a good turn around area rather than backing into the pits from the course. ALSO a car must be on the course competing for a minimum of 10 cumulative minutes out of the total race time. Hope to see everyone at our first race September 22, 2018 at Hillsborough Community College in Brandon Florida. On September 22, 2018 our first race is from 10 am to 11 am and our second race is from 1 pm to 2 pm with an awards ceremony to follow. On September 22, 2018, Electrathon of Tampa Bay will hold our first race of the 2018 – 2019 season. We will be at Hillsborough Community College located at 10451 Nancy Watkins Drive, Tampa, Florida 33619. Set up will begin at 6:30 A.M. ALL team members will be required to attend the drivers meeting before our first race of the season. The first race line up is 9:45 A.M. and the green flag will drop to start the race and race season at 10:00 A.M. The second race line up is 12:45 P.M. and the green flag will drop to start the race at 1:00 P.M. Clean up and awards will follow. Hope everyone has their cars ready to go and remember to do all of your safety checks and be knowledgeable and understand the Electrathon America Rules and Guidelines for the car, driver(s) and teams. We welcome everyone back from their summer break. 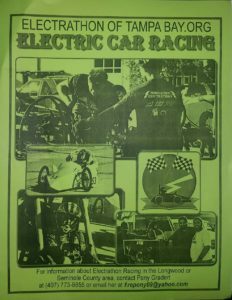 We hope everyone had a great summer and are ready to start another fun and exciting season of Electrathon Racing. Over the summer, ETO has not been very active due to a few personal family obligations that required all of my time and energy. The Executive Board will be meeting on Thursday, September 6, 2018 at Cracker Barrel in Seffner for our kick off meeting of the minds for our 2018 – 2019 Race Season. Executive Board Members arrive around 5:30 P.M. for dinner, meeting will start at 6:00 P.M. The All Team Board Meeting / Sponsor and Team Captains meeting will be held on Thursday, September 13, 2018 at the Cracker Barrel in Seffner. Board Members arrive around 5:30 P.M. for dinner, meeting will start at 6:00 P.M. Please contact Charlie or Fredi to confirm or decline attendance. Our 2018 – 2019 Race Season is posted, we are waiting on confirmation of three race locations for our races. As soon as we have them confirmed, they will be added to the schedule. The out of area races (not ETO Events) have not been scheduled, as soon as we get the information, they will be added to the website. On Saturday, May 12, 2018, Electrathon of Tampa Bay held our ninth and final race day of the 2017/2018 season at the Florida Energy Center in Cocoa Florida. The race was held in conjunction with the 2018 Energy Whiz. We had five High School Division cars, five Open Division cars and three Advanced Battery Division cars. A great BIG THANK YOU goes out to Florida Solar Energy Center Staff Members for everything they did to make our last race a success. Charlie wants to recognize Rodney Schreck for always coming a day early from Hialeah to help set up the race tracks this season. The day started out pleasant as the teams arrived for the races. Inspections were completed and a few cars took advantage of the 30 minutes for practice laps. During the race day, drivers had to be careful as the water sprinklers came on and watered part of the track in one of the turns. 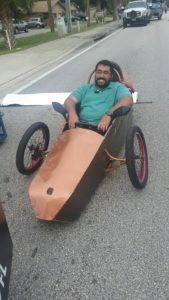 It was great to see Pro EV, Seminole State College, Brooks Debartolo, and our new team from STEM Tech at our last race of the season. Mulberry High School Sponsor Todd Thuma came to the race to support ETO but his team was unable to make it, wish he stayed to receive his team’s award. Simmons ran strong until they destroyed the front end of the car as the wheel supports/frame finally let loose. Brandon continued to have challenges with their tires/tubes. Titan racing found out that the throttle was too sensitive as they approached turn one and almost met with the side of the Pro EV car. USF car 132 and Pro EV car 39 were the cars to watch as the competition and driving skills came out. High School Division – 1st place, Brandon HS car 14 with 121 laps, 2nd place, Brooks DeBartolo car 55 with 87 laps, 3rd place, Brandon HS car 9 with 76 laps, 4th place, Simmons Career Center car 35 with 24 laps and 5th place STEMTECH car 823 with 14 laps. Open Division – 1st place, Tiger Racing car 4 with 153 laps, 2nd place, Silver Bullet Racing car 94 with 149 laps, 3rd place, RYNO Racing car 13 with 49 laps, 4th place, Seminole State College car 314 with 40 laps and 5th place, Hillsborough Community College car 30 with 3 laps. 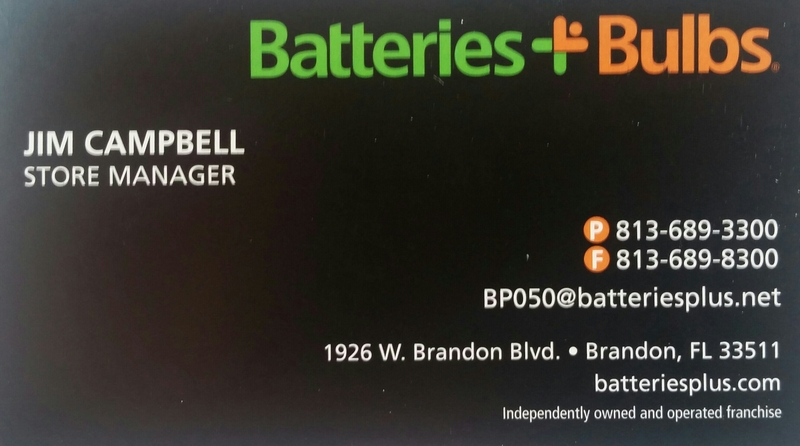 Advanced Battery Division – 1st place, Pro EV car 39 with 171 laps, 2nd place, University of South Florida car 132 with 121 laps and 3rd place Titan Racing car 242 with 80 laps. High School Division, 1st place, Simmons Career car 35 with 348 points, 2nd place, Brandon HS car 14 with 328 points and 3rd place Simmons Career Center car 53 with 324 points. Open Division, 1st place Tiger Racing car 4 with 464 points, 2nd place Silver Bullet Racing car 94 with 228 points and 3rd place Hillsborough Community College car 30 with 214 points. 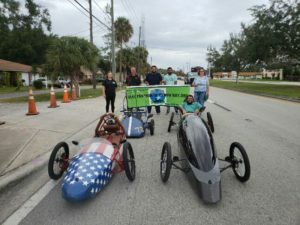 Advanced Battery Division, 1st place, University of South Florida car 132 with 404 points, 2nd place, Pro EV car 39 with 330 points and 3rd place, Titan Racing car 242 with 158 points. Please support Electrathon of Tampa Bay by making a donation.